Tiffany engagement rings reflect the highest jewelry standards in the world. Rings come in Tiffany's signature little blue box and are tied with a silver ribbon. For many women, these rings represent only the best quality and commitment to perfection -- which mirrors the joy and promise of love. An authentic Tiffany ring can only be purchased at one of the company's retail stores. You can view a complete retail store listing on the website, or select stores by state. 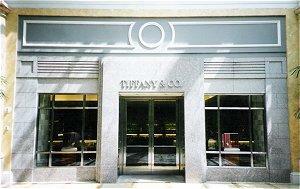 Tiffany jewelry stores can be found not only in multiple locations in the United States, but throughout the world. You can also consult a Tiffany Diamond Expert to purchase a ring by phone. Tiffany then will ship the ring directly to you. To explore this option or to schedule an in-store diamond engagement ring consultation with a Tiffany sales representative who will be able to help you choose the best ring to match your budget and style, call 800-518-5555. Tiffany & Co. has been designing exquisite jewelry that highlights the incomparable beauty of diamonds. The company created the famed Tiffany setting: a six-prong arrangement that raises the stone above the ring's band, allowing the maximum amount of light into the diamond to enhance its brilliance. This setting is one of the most popular engagement ring designs today. Visit the Tiffany website to see the range of styles available for engagement rings and to get an idea of what type of ring most interests you. Legacy: This glamorous setting is done with a solitaire cushion cut diamond surrounded by bead set diamonds. Novo: This setting features a brilliant cushion cut diamond set on a band of sparkling stones. Embrace: A romantic design featuring a round center stone on a band with bead set diamonds. Etoile: You can choose from a single or three stone bezel setting on a wide band. Rings are available in platinum and gold and in settings such as solitaire, pave, three stone, diamond band, and side stone. The highlight of any engagement ring is the central diamond. At Tiffany & Co., only the finest gems are selected and the company maintains rigorous standards well above the industry norms of other jewelers. Many people equate carat size with a diamond's value, but Tiffany diamonds are selected not for exterior size, but for interior quality. When cutting stones, Tiffany gemologists take great care to remove every possible flaw. While this may result in a smaller stone, the exceptional quality makes it a far more valuable diamond than a larger, less precisely cut gem. Tiffany diamonds are never enhanced or heat treated, and only the best stones are accepted by the company to be made into superior engagement rings. For example, of the eleven grades of clarity, Tiffany only accepts the top six ratings, all of which appear flawless to the naked eye. In terms of color, only diamonds rated I or better are accepted. Because of these rigorous standards, Tiffany rejects many stones with very minor flaws, inclusions, or imperfections that may be acceptable to other jewelers. In addition to the four Cs of diamond quality, Tiffany & Co. also enforces their own guidelines of precision, symmetry, and polish. Precision refers to the exact dimensions of every facet on the stone: every angle, every surface, every plane must be perfectly proportioned for maximum brilliance. The symmetry of the stone is also vital, because a poorly cut stone will appear lopsided and have less sparkle. A stone's polish greatly enhances its natural beauty, and only the best stones appear in Tiffany's blue boxes. When you buy a Tiffany engagement ring, you buy not only a quality stone but also a superior ring. Every Tiffany piece is hand-finished and hand-polished for the maximum brilliance that can only be wrought by an experienced professional. All rings are set in either platinum or 18 karat gold for versatility and durability, and no matter what metal is used to fashion the band, every diamond is carefully set in platinum prongs to maintain the white integrity of the stone's appearance. Tiffany & Co. is so assured of its engagement rings' quality that each one is accompanied by their personal certification. While every jeweler will offer diamond certifications, a Tiffany certification is a true guarantee about the stone's authenticity, quality, and value. The high quality of a Tiffany ring does not come without a high price tag. Pricing on the engagement rings ranges from just over $1,000 to well over $1,000,000. Depending on the ring design, a one carat diamond engagement ring ranges from $9,500 to approximately $35,000. With superior quality and exquisite design, there is no higher standard for an engagement ring than those set by Tiffany. For a truly exceptional piece, the best choice is a simple blue box.